The car trip from Sofia to the Bulgarian Black Sea resort of Kavarna is supposed to be a smooth ride of 546 kilometers, or six hours and 12 minutes, for the Southern approach via Trakia Motorway. It isn’t. Up until Bourgas, things are fine, on an early Monday morning in mid-August. Deviating from the Google Maps route just a little leads to the first issue: The usual traffic jam around Pomorie costs travellers an hour. An accident in the same area slows things down even more. The official deviation route turns out to be the worst road on the continent. It makes travellers elaborate whether they should have stayed in the traffic jam for another hour or two, rather than choosing this one. But North of Sunny Beach, also known as Slanchev Briag, things calm down. The last 120 kilometers could have been enjoyable, had the travellers not gotten up at 4 o’clock that morning. Kavarna! There she is. The sleepy marvel of the Northern coast, located 43 kilometers South of the Bulgarian-Romanian border. In this town of 11,000 inhabitants, the way towards the Kavarna Hills, the touristy area, leads through a Roma slum, in which trash is piled up between little houses. The hills are a little paradise. Two small beaches offer chaise longues and umbrellas, but are half empty most of the time. The only large restaurant offers excellent seafood and smooth saxophone sounds, instead of the usual ultra-loud “boom boom boom” terror. Before 7 am, a few 50 to 60-year-olds are fishing on the side of a narrow road which leads to a small quai. Over here, a small cutter arrives, and delivers four large polystyrene boxes full of fish and ice. Two men squeeze the merchandise into the trunk of a run-down Opel Astra and disappear, leaving behind one foreign amateur photographer and three stray dogs. Several smaller hotels on the hills overlooking the bay offer little pools, well-equipped holiday apartments and picturesque views for relatively modest prices. Having a car is a requirement for holiday makers who choose this place, or they will be cut off from the rest of the world. The next CSA supermarket is some 4 kilometers away, Lidl is located in Balchik, 18 kilometers West. Even Kavarna itself, the little town with its empty pedestrian zone, is too far away. Whoever expects the Sun to rise East, like it does everywhere else, will be disappointed. Our star comes up in the North. At least that is what it feels like since the horizon behind the Black Sea is South of the beach. So, no romantic sunrises or sunsets. But up here, there is a lot to see. The Fortress of Kaliakra is a good location to walk around at. Near-by Bolata Beach feels like Henne Beach in Denmark, since cars are allowed, right there on the sand. Still, it is one of the nicest beaches in the Kavarna area. So, hardly any wind parks can be found in Bulgaria? Wrong. There are an estimated 100 windmills with turbines up here, delivering sustainable energy. A lot of it. Those windmills might be smaller than those found in Western European countries, but they do their job. At Shabla Lighthouse, which is advertised as a tourist destination, absolutely nothing can be seen, except for that little, fenced-in tower. It isn’t worth it. The same applies to the Taukliman Bird Bay. That one does not even exist anymore. But a short trip in that direction will lead nature lovers to yet another little paradise, the Rocks of Tyulenovo. In millions of years, the Black Sea has eaten beautiful shapes and caves into them. A bunch of some 20 young Bulgarians from Sofia set up their little tents up here. The men wear fancy beards, which identify them as hip adventurers, while some of the women wear long skirts made in India. Nobody will mistake these people for Sunny Beach tourists. They found just the right spot for their meditations, but also their rum and whisky parties. The empty bottles are all over the fire place. 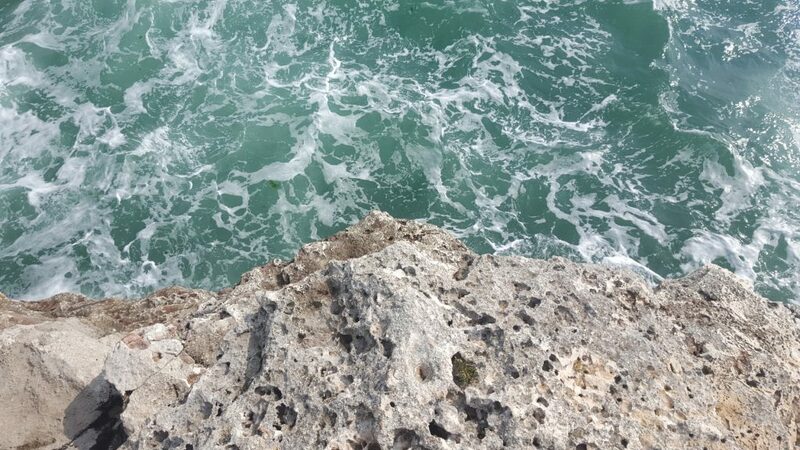 Also they identified the perfect place to jump into the Black Sea from cliffs. But the latter is a dangerous sport. At least three young men have died here in the past eight years, while trying to impress their friends with jumps from the rocks. Crystals can be found up here, on these beautiful rocks. It is getting hot? Well, some of the edges of these cliffs get hit by sea waves all the time. Hikers can take seawater showers, just by approaching the edge, but carefully, since some of those rocks are slippery when wet. For tourists who are into beaches more than rocks, Balchik Beach is an interesting one. It is located right next to the town’s port. Visitors who manage not to get run over by those heavy trucks, which drive by the entrance to the beach every few minutes, will have a good time. So the Northern Black Sea coast is colder? Not this year. The seawater is cooler? Maybe, by a degree or two. Maybe five. There are less beaches up here? True. And less tourists. The North is more quiet and does have a lot to offer. The water feels cleaner.